We ship UPS every Monday and Tuesday. 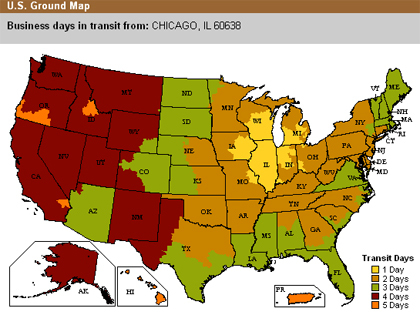 Most locations in the US will receive UPS ground delivery in 1 to 3 days. UPS 2nd Day Air and Overnight Air are options for more perishable items to distant locations, or simply for faster service. Many of our products can be shipped by UPS, including Breads and "Raguolis" from our bakery, and packaged goods and sausages from our Deli. You may place your order by sending us a fax order form or simply call our office to speak with our staff.